In 1881, D’Oyly Carte offered Wilde the opportunity to travel to the US as the advertisement of the Gilbert & Sullivan operetta Patience or Bunthorne’s Bride, which was the sensation of the day. This proved to be a pact with the devil as the operetta made fun of Wilde and people who cared about art. Nevertheless, on Christmas Eve 1881, a 27-year-old Oscar Wilde wrapped himself in a fur cloak, boarded the SS Arizona at Liverpool, and set off to the US for his 50 date lecture tour across the country. The below map shows some of the stops of his tour and the experiences he had. Featured image credit: Oscar Wilde, photographic print on card mount, circa 1882, by Napoleon Sarony. Public domain via Wikimedia Commons. Michèle Mendelssohn is a literary critic and cultural historian. She is Associate Professor of English Literature at Oxford University. She earned her doctorate from Cambridge University and was a Fulbright Scholar at Harvard University. Her previous books include Henry James, Oscar Wilde, and Aesthetic Culture and two co-edited collections of literary criticism, Alan Hollinghurst and Late Victorian Into Modern (shortlisted for the 2017 Modernist Studies Association Book Prize). She has published in The New York Times, The Guardian, African American Review, Journal of American Studies, Nineteenth Century Literature, and Victorian Literature and Culture. 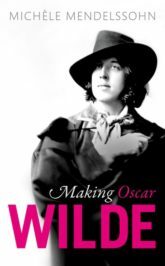 Her latest book is Making Oscar Wilde.